Following the Premier Feathers, in which Harry Winston perfected feather art to decorate its dials, this year’s Premier Precious Butterfly Automatic uses the lustrous powder found on butterfly wings. How? you may ask, as did I. 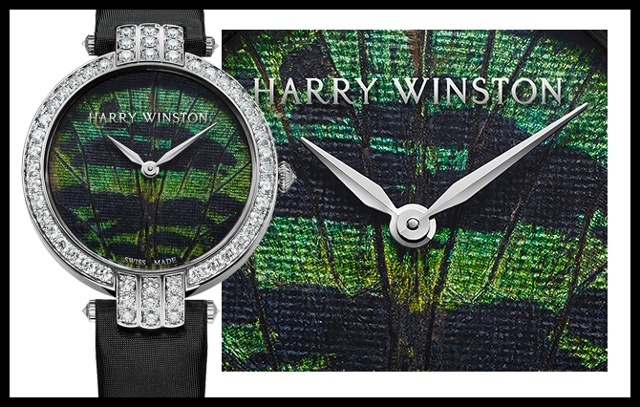 It seems Harry Winston designers found a method to harvest the precious dust without causing harm to the tiny donors. Using proprietary techniques, it is then transferred to the dial to create an amazing kaleidoscope of colorful—and natural—iridescence. And each dial is unique, giving every one the fine-art status it deserves. Shown here is the emerald green version (there are three versions in all), and I must admit that the image is a far cry from the real thing, which absolutely shimmers in the light. To add to that shimmer, the 36mm gold case is set with 57 brilliant-cut diamonds. Inside is a finely decorated automatic movement with a silicon balance spring.